A movie for all ages. Funny and cool Kung Fu. Looks like there will be another sequel. My whole family enjoyed this movie. Many funny and cute scenes. We have watched it over and over. Good concept, but concerned about the violence it's teaching young children. funniest movie of all time i could not keep on one emotion i just loved it!! Liked 1st one better, but good family fun! Cute movie, sadder than the first. My son loved this! I thought the movie was great. 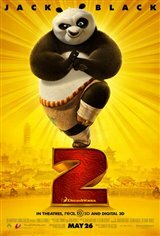 The revelation about PO and how he came to be was inspiring. The ending left me wanting to see the sequel immediately.